For some reason I keep holding myself back. It’s a mental block I suspect. I read about writing. I talk about writing. I read other people’s writing. I write for clients when they pay me to do so. But I refuse to sit down and write something for myself. Why is that? Prevailing wisdom would suggest Fear is the culprit. Wisdom is wise, isn’t it? One of my 2011 goals was to “write a novel.” Luckily, I didn’t stipulate that it needed to be a “good” novel. There’s a reason first drafts don’t get rushed to the printer. 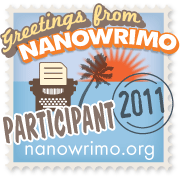 Even luckier for me there’s such a thing as the National Novel Writing Month, or NaNoWriMo as the insiders call it. It’s a personal challenge for people to write a 50,000 word novel during the 30 days of November, starting midnight November 1. That’s in an hour. I’m sure there are people on the east coast perched at their keyboards pounding out what they hope will be the next great work of literature. When midnight strikes Chicago, my wish is to be fast asleep ridding myself of the sinus headache that’s plagued me all day. I don’t think the red wine tonight helped my cause. Maybe the fact that I’m not rushing to write something the second this “contest” begins is evidence of the larger issue at play. Or maybe I’m tired and am approaching this quest as a marathon not a sprint. I have 30 days to find out.